The United States needs better food systems, and it needs more jobs. Aquaponics, a relatively new type of urban food production model, can give us both—sustainable food and green jobs. Currently, the U.S. imports about 85 percent of our seafood, a large fraction of which is produced in overseas fish farms, by a process called aquaculture. Another 10 percent is “domestic wild catch,” which is made up of seafood caught by U.S. fishermen (NOAA). The remaining 5 percent comes from U.S. aquaculture. As global wild catch declines, aquaculture is steadily increasing as a viable replacement, although some aquaculture operations are criticized for being sited in open water or rivers, where fish escapes, exchange of fish diseases between farmed and wild fish, and environmental pollution are of concern. But there is a different approach to aquaculture that addresses many of these concerns: aquaponics. Aquaponics is typically land-based, closed-system farming that is designed with the principles of agroecology in mind— fish species and vegetable crops are raised together in harmony— because fish waste serves as liquid plant fertilizer and plants strip the water of chemicals that are harmful to fish. Today, fish such as tilapia, yellow perch, blue gill, and catfish are being raised in aquaponics systems in urban settings across the U.S.
Aquaponics systems recycle as much as 99 percent of their water though the system using biologically inspired models. Farmers use a combination of physical treatment methods to remove fish waste, such as gravel bed or clarifiers, and biological treatment using edible plants as biofilters and bacteria as denitrifiers to clean the water. As a side benefit, the leafy greens and other crops raised in aquaponics make for a tasty pairing with broiled, baked or grilled fish. 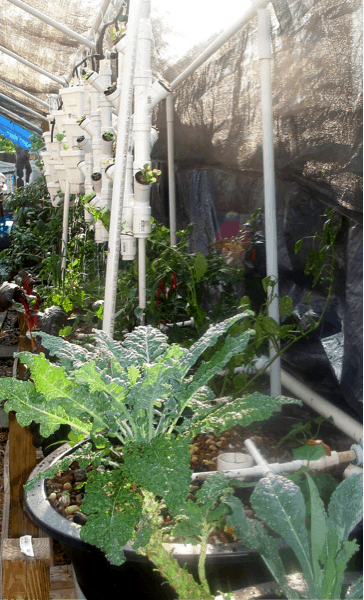 The aquaponics movement is in need of leadership after Jim Rakocy, a professor at the University of the Virgin Islands and champion for aquaculture, recently retired in 2010. Fortunately, there is a new group, Recirculating Farms Coalition (RFC), poised to organize the movement. The RFC has as its aim to “establish(es) a healthy, natural, and community-based way to grow fresh food… [and] to motivate change and build a movement calling for local, healthy, sustainable food” [from RFC website]. Urban fish farms both large and small are attracting attention for their potential to impact local communities. Walmart recently announced a $1 million dollar grant to Growing Power, a Milwaukee-based recirculating aquaponics farm and nonprofit organization. Other, less well-known operations that RFC spotlighted recently are also making an impact in their local communities. At his farm, which is tucked behind a strip mall in Winter Park, Florida, Sahib Punjabi raises fresh produce, ornamental fish, and uses the facility as a teaching center (image). Aquaponics strikes me as a great solution for rebalancing the seafood trade deficit in the United States. I hope that organizations such as RFC will be successful in inspiring investments in aquaponics and other agro-ecological models for aquaculture.